It was just on Tuesday morning that we did a review of the performance of GERN, a stock we had initially tagged on February 5th. It had made considerable progress over a six week period, and after a fantastic session yesterday, the stock once again shot to new highs. It ran all the way to an even 5.00, which from the 2.025 low we observed in early February, marks an increase of 147% This week has brought the highest volume, and now the highest PPS since 2015 for GERN. With the stock well into Blue Skies, we’re be interested to continue following its activity. Speaking of stocks on our radar that have enjoyed longer-term success, we want to talk about DRRX again this morning. 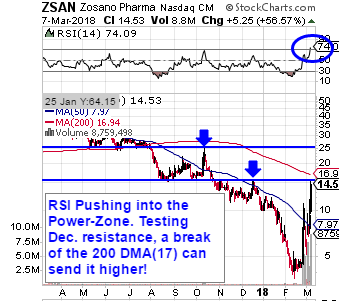 We’ve been tracking this stock since mid-December (12/14), and in two separate runs here in 2018, we’ve seen it make fantastic progress. Subsequent to our original alert, DRRX registered a low of .875, and from there, yesterday’s high measures as a 151% increase. In yet another month-long gainer, we have NIHD. We signaled out interest in tracking this play back on the last day of February and it has been steadily ramping its way up all month long. We’ve witnessed a run from a low of 1.115, to yesterday’s new high of 2.28, marking a 104% intra-month move. 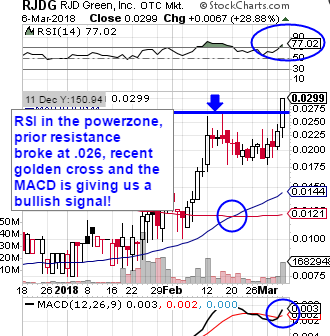 We’re coming back to RXMD once again to review this unstoppable momentum play that has appeared in five of our last six reports. After our initial mention of this play on February 22nd, we witnessed a low of .0663 and it hasn’t looked back since. 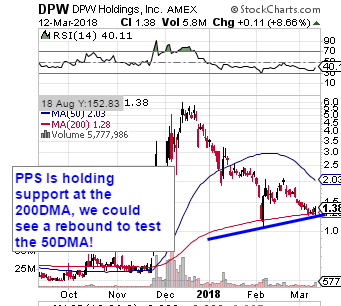 We want to tag DPW this morning as a potential bottom bouncer, after noticing an interesting chart setup. As we’ve pointed out on the following snapshot, the stock has come down to what we feel is a pretty solid area of support, and looks like it may try to make a run at its 50DMA. It also saw a pretty good surge in volume yesterday, so we’ll place it on watch today.